Anyway, the next few articles will mainly be for MindManager tragics, like me (MindManager being the leading mindmapping program, at least on Windows desktop machines – see here for an earlier article discussing mindmapping). As a dedicated MindManager (MM) user I’ll look at some of the more obscure features of this great program, which I use almost daily for brainstorming, project management, research and a range of other tasks. Now while I may have called it “great”, MindManager is certainly not without its problems. This first post will deal with one of the more obvious ones – the surprising lack of a facility to export formatted slides to PowerPoint based on branches of the map. 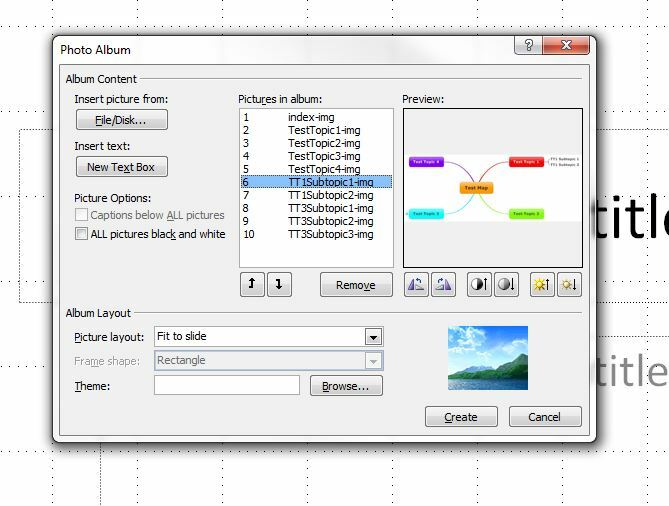 MM’s own slide software can be used to create, show and print slides which are effectively snapshots of the screen, but to export these to PowerPoint there are only two “official” choices; export the map as bullet points, or select the option which relies on PowerPoint’s rather primitive topic shapes and lines to build a very basic presentation. Users who want to export MM’s own graphics have been forced to rely on a couple of workarounds. For very simple maps, a program like Windows’ snipping tool can be used to grab an image of whole map and paste it in a presentation. For more complicated ones however, most people have gone through the cumbersome process of using image capture software to copy the map piece by piece and pasting the resulting images one-by-one into PowerPoint slides. Andrew Wilcox, a leading UK mindmapping expert, had a brainwave about this, as he describes on his blog. He decided to explore MM’s abilities to export web pages. These turn out to consist of a set of pages in HTML but with images of the map branches saved as JPEGs – in fact, a formatted image of every branch, each focussed on a different topic, down to the map level selected by the user – “hidden” in the web export folder. 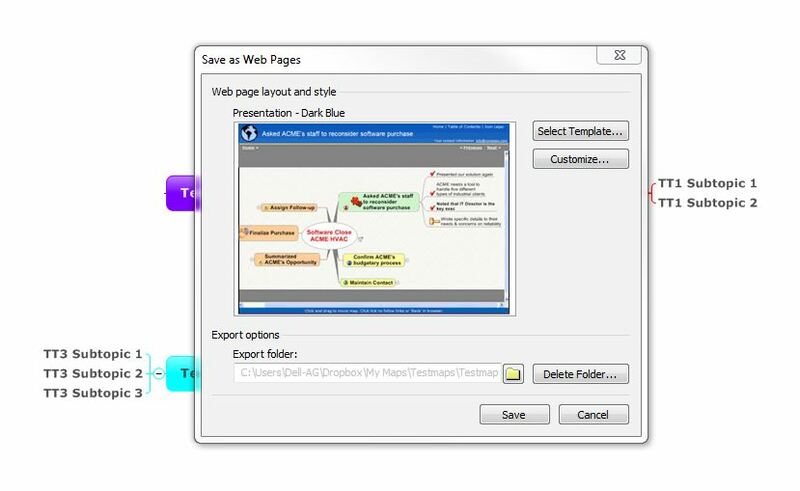 Export to web using the Presentations template (Andrew suggests playing with the Customize – Advanced settings in the template to get the best results). Create a new PowerPoint presentation or use an existing one. Then insert and link the image files you will find in the web export folder. Tip: It helps to sort the folder by file type. This is quite effective, though for some reason I’ve never been able to get Insert and Link to work properly in PowerPoint 2010 so I just use Insert. This means I miss out on the ability to refresh the PowerPoint presentation automatically every time the map is updated. Andrew wondered in his post if he had missed something obvious in PowerPoint to speed up image importing in a similar way. It occurred to me that what was needed was a mechanism for the batch processing of the import of image files – and too my surprise, a web search revealed that there is indeed such an option. I’ve outlined this approach below, followed by a few other options to create a PowerPoint presentation from an MM map. The batch process I mentioned is “disguised” as PowerPoint’s Photo Album command. Part of the reason this feature gets overlooked is its command name; “Photo Album” suggests that only photography enthusiasts would be interested, but like MM’s web export this feature has much wider potential. Effectively it means that multiple images from any source can be imported to PowerPoint and pasted into separate slides in one process. Open a map in MindManager and filter it to show only the topics you want to export, then create a web export as discussed above. Switch to PowerPoint and create a new presentation (beginning the import will create a new “album” anyway). Under the Insert tab on the ribbon, click on Photo Album and then choose New Photo Album. When the Photo Album dialogue box appears, click on File/Disk and navigate to the web export folder you created earlier in MM. Highlight the JPEGS created by the web export and click on Insert. The files should appear in the Pictures in Album section of the Photo Album dialogue box. Here you can change the order of the files or remove individual ones. Under Album Layout choose one of the options. The default is “Fit to slide”, which will fill the whole of the slide with the image. The other useful one is “1 picture with title” which will generate a conventional slide layout with a blank space for the title. When you are ready, click on the Create button to generate the photo album, which should contain a slide for every map. In addition a title slide called rather cheesily “My Album” will appear. ; you can either rename this or delete it entirely. Finally, either format the new presentation or import the slides into an existing one, sorting and deleting them as required (see comments below). The great thing about this approach is that once you have created the presentation you can use the Edit Photo Album command to update it. Admittedly this is a little clumsy – you have to remove any topics you have edited and replace them with the new ones which results in a new presentation being generated, but any slide headings and formatting added after the initial import should be retained. However if you delete any slides you may affect the relationship between these headings and the remaining slides. This approach generates a lot of slides – literally one for each topic down to the map level you have selected – usually sorted in alphabetical rather than map order. You can sort and edit the original JPEGs during the import process, but it’s probably easier to do this once the slides are created. There is an option to insert a link in the photo album dialogue box but in my experience (and that of several others who have described the photo album process) this doesn’t seem to work. The index JPEG which shows the full map is always fuzzy and the text unreadable. It turns out the sole purpose of this image is to act as a thumbnail image on the web page, so it is generated at low resolution. If you need a full map you will have to capture it using the Window’s snipping tool and import it manually. A blue box is placed around the topic which is the focus for each slide. However this can be removed in the advanced settings for the web export. On the positive side the process is relatively quick and the JPEGs are better quality than those obtained by capturing map images. I also imagine it would be possible to automate the process to a large degree using two macros – one in MM to create the web export, the other in PowerPoint to import the maps. While direct export to PowerPoint of MM slides isn’t possible, you can achieve much the same outcome by using third-party software. This gives the user much greater control over which topics are used for the presentation and you could preview the slides within MM. Use Adobe Acrobat or Adobe Reader to “present” the PDF file. This is a surprisingly effective option, especially as the Reader program is free and probably more widely available as PowerPoint. In either Acrobat or the Reader go to View and select Full Screen Mode to mimic a PowerPoint presentation. Go to Edit and then Preferences to change how this mode will behave, for example adding transitions between pages. While the result is not as sophisticated as a PowerPoint presentation it is surprisingly useful. You can also combine the slides with others generated in PowerPoint as part of a larger presentation if you save the latter to the PDF format, providing you have Acrobat or other PDF editing software. Use conversion software to create JPEG files from the PDF file. Under this approach you use a third-party batch conversion program to convert the PDF pages into JPEG files and then insert these into a PowerPoint presentation either manually or using the web export approach described earlier. Use Adobe Acrobat or third-party software to convert the PDF file directly to a PowerPoint presentation. Probably the best way to do this is with Adobe Acrobat, but this feature is available only in the latest version 11 and the cost of purchase or upgrade is quite high. However there are a number of third-party conversion programs which can do this with varying degrees of success. One thing to watch in doing this is whether the resulting PowerPoint slides are static or editable. While the latter may seem more desirable, often it is only the text itself which can be edited but not its position on the page, which can lead to strange results if the slide graphics are resized. A word of caution regarding these options. I have not been able to review all the third-party programs so I don’t feel I can make recommendations, however it is clear that a number of “free” PDF drivers, PDF-to-JPEG and PDF-to-PowerPoint converters are not so free after all. Many require paid upgrades to work properly, or they involve advertising or worse still, they load adware and other programs without the user’s knowledge or consent. It’s important to read the reviews and to check out online comments about these programs before you select one to download. 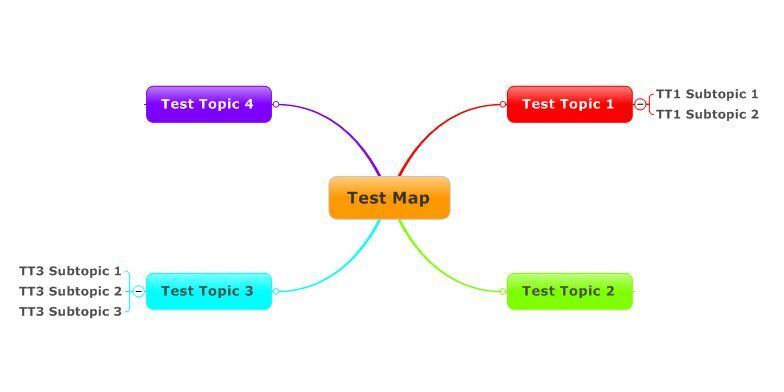 This entry was posted in Export, Mind Mapping and tagged Mind Mapping, MindManager. Bookmark the permalink. Want help with mind mapping and using MindManager in your organisation?